No longer will you be constrained by the available ports on your notebook. Expand your workspace with single 5K display(using Dual DP) or dual 4K displays and stay connected to all the devices you need to help increase your productivity at the office or for better flexibility at home. 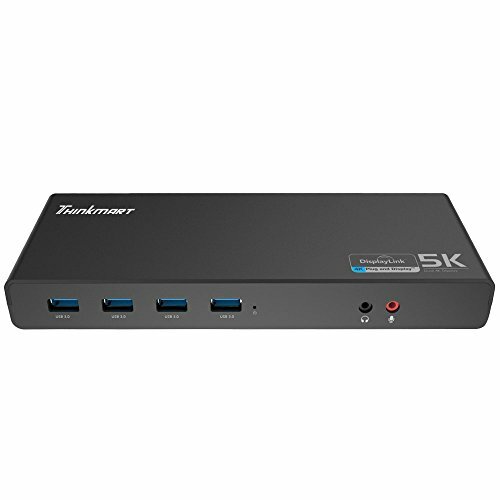 Connect to all of your peripherals(6xUSB3.0, 2x HDMI, 2x Display Ports, Gigabit Ethernet, Audio input/output ) at once via a single USB-C to USB-C or USB-C to USB-A cable, so you can instantly expand and customize your workspace. Enjoy universal compatibility with a wide range of PC brands and operating systems (WinXP to Win10, Mac OS up to 10.11 ). The ultra 5K dock works well with both Type-C and Type-A USB Laptops/Desktop PC's. • Supports Full 5K HD+ resolution when using two DP simultaneously (5K @ 60Hz, via dual Display Ports only). • Dual 4K HDMI/DisplayPort (4096 x 2160) @60Hz. 2. Dock does not charge the host system. 3. For UHD content (4K/5k) output, the host system must be capable of decoding the 4K/5k video in the graphics processor. 4. Customer support: sales1@thinkmart.cc or support@thinkmart.cc. Ultimate Experience: Supports resolutions up to 5K ( 5120x2880 @60Hz ) when using dual DP simultaneously and with a 5K monitor. Dual 4K@60Hz resolution through HDMI/HDMI, DP/DP or HDMI/DP displays. One-Stop Upgrade for Laptop: Gain access to a wide selection of ports including two DP ports, two HDMI ports, six USB 3.0 ports, a headset jack, audio/mic jacks, and a RJ45 Ethernet port as well. Universal Compatibility: Fully compatible with both USB Type-C and Type-A Laptop/Desktop Computer (Both USB-C to USB-C and USB-A to USB-C cables included). SuperSpeed Connection: Six USB 3.0 ports give you access to SuperSpeed data transfer rates of up to 5Gbps. High Speed internet connection through embedded 10/100/1000BASE-T Gigabit Ethernet port. Kindly Note: ★This dock doesn't support Power Delivery function. ★ Higher laptop CPU will help you to get a fluent HD display output. ★For UHD content (4K/5k) output, the host system must be capable of decoding the 4K/5k video in the graphics processor. ★5K only via dual Display Ports.